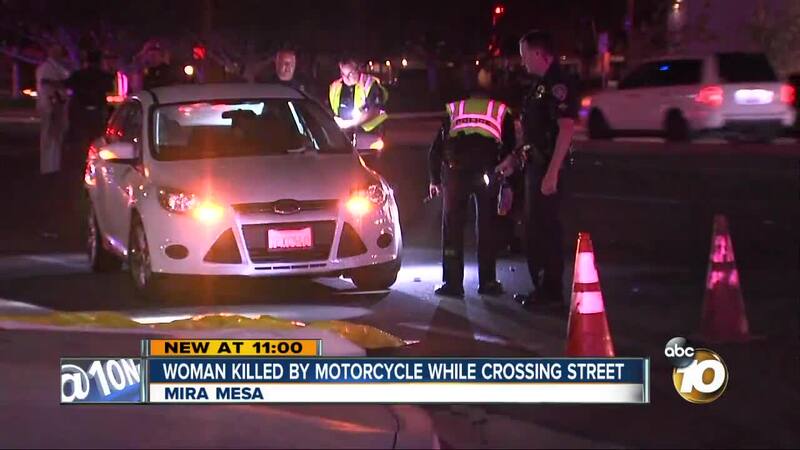 SAN DIEGO (KGTV) -- San Diego Police are investigating the death of a woman who was hit and killed by a motorcycle in Mira Mesa Tuesday night. The crash happened around 8:20 p.m. near the intersection of Mira Mesa Boulevard and Camino Ruiz. The 83-year-old woman was walking across the road when she was hit by the motorcyclist and died of her injuries, police said. After arriving on scene and seeing that the woman was not in a crosswalk and was wearing dark clothing at the time of the crash, SDPD determine that the motorcycle was not at fault. The motorcyclist was taken to the hospital where he was treated for a broken clavicle.